Everyone knows a good psycho thriller always involves some kind of countdown. It really increases the suspense. Microsoft seem to have adopted a similar tactic, which is great at first glance. After all they are warning you that your DATA WILL BE DELETED. Definitely something I want to know about and constantly be reminded of if I don’t take action (no sarcasm here actually!). It was my understanding that as long as “Assigned” licenses <= “Valid” licenses then everything is fine. I could let those expired licenses simply expire. 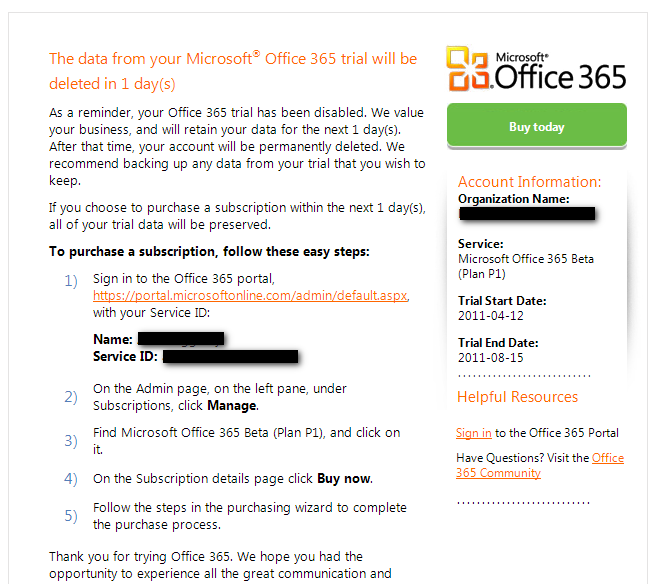 Now I’m not easily irritated and assume that the Office 365 Portal simply forgot to do the math and just sends those warning whenever trial licenses are in your account. But an assumption won’t be enough for customers asking the same question, so let me reassure myself and them. First of all I really appreciate that the warning email is not sent from a “noreply@microsoft.com” – it actually goes to msonlineservicesteam@microsoftonline.com. Awesome, that’s a +1 over Google Services (where asking questions per email is apparently a no-no). Quickly fired off a reply asking what the warning will do in my scenario. This was back at the beginning of September. A couple of days ago I got the “7 day warning”. I again sent an email reminding them they had left my email unanswered and asking what to do. Still no reply. WTF? I did pay my subscription didn’t I? I know there is a great forum (and I have received helpful information there before about technical issues) but this is a financial/licensing (and usually confidential – especially for customers) issue which I’m not going to post on a public forum – that’s why I am a paying customer and expect answers to questions like these via email. Sadly I don’t even know if my email was ignored, deleted or is still in progress, because I didn’t get any answer at all. Not even one of those kind automated emails thanking you for your email. Implement some form of ticketing so that I at least know my issue arrived and is being looked at by someone. Or simply don’t send out warning emails if my data is not really in jeopardy. All I can do at the moment is wait for tomorrow and hope our data is safe (and of course run a backup tonight). For anybody who finds this and is worried what really happens. The deadline went by and as I had suspected it was just an overanxious e-mailer and in reality as long as “purchased licenses” >= “assigned licenses” then you are fine. No data was lost, no customers were upset. Just a case of bad communication. Next Next post: How do I run dotLess on embedded resources? or How to embed .less files in assemblies? We Duggleby’s look out for other Duggleby’s due to a scarcity of subjects – there are pockets of us near Phoenix, Saskatoon, Vancouver (B.C.) and many other strategic locations, including (of course) Duggleby, England.